Welcome to State-of-the-Art cosmetic enhancement! Looking for a safe more permanent solution to look your best everyday? Permanent makeup has come a long way recently. New pigments and methods offer technician artists many options never seen before. Now technicians can place pigment precisely in multiple shades and layers using much smaller pigment molecules than before. Not available a few years ago, allows for more precise pigment blending preventing unnatural blotchy color fading over time while producing nearly perfect (to the naked eye) natural cosmetic results. For eyes and lips, pigment placement mimics the skins outer cellular layering. Wake up looking great everyday! WHY CHOOSE US! Prior to your procedure you receive a consultation that demonstrates exactly what your end result will look like. Using pictures and sketches, your design is drawn directly upon the actual area to be treated. You’ll see clearly how it will look before the procedure begins. We work together to make it the way you like it, no problem. Our signature Lash Line Enhancement procedure incorporates the magic of Microblading to enhance in certain circumstances. Focusing on enhancing the fullness of the eyelashes at the base. Using delicate and precise strokes, complimentary pigment shades are deposited under the first (epidermis) layer of skin along the lashes using our state of the art PIBROW© Micro-pigmentation Enhancment tools and pigments. Lash Line Enhancement is great for anyone who wants to enhance or correct the look of their lash line in a subtle and semi-permanent way. Our signature Lip Line Enhancement procedure incorporates the magic of of a blended line with complementary colors to work as a base with a variety of lipstick shades. Using delicate and precise strokes, complimentary pigment shades are deposited under the first (epidermis) layer of skin along the lip line using our standard PIBROW© Micro-pigment shades in lipstick colors. Great for anyone who wants to enhance or correct the fullness of the lips naturally. For any of the seven conditions listed below, we can make the appropriate corrections using PIBROW© Micro-pigmentation Enhancment techniques. 1. If your lips are too small or thin: We can exaggerate the lip line slightly. 2. If your lips are too large: We implant pigment inside of the natural lip line. 3. If your lips are flat or have lost volume: We use a lighter shade of pigment in the Cupid’s bow. 4. If we need to restore your natural lip line: We outline your lips to create a symmetrical lipline. 5. If your lips are droopy: We draw the bottom lip line slightly up and out at the corners to give your lips a lift. 6. If you need a defined Cupid’s bow: We can define the bow. Your colours can range from the softest pink- to coral- to a soft red. 7. If your lips have uneven tones, hyper-pigmentation or hypo-pigmentation: We blend a colour to balance your natural lip color. 8. Cleft Palette can be made to look less noticeable. 9. Surgery Scars are commonly reduced using micro-pigmentation. A WORD OF CAUTION: Everyone has blue undertones in their lips. Some have more than others. PIBROW© PME Technicians are specially trained to take this into consideration when choosing your ‘cool’ or ‘warm’ lip pigment color. RichEyes.NYC Micro-Pigmentation Permanent Cosmetics are ideal for all individuals who desire to enhance or correct the symmetry and shape of their eyes, lips and brows. 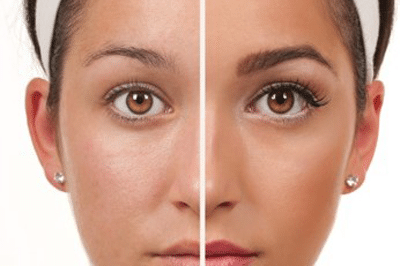 Many people of color are concerned whether or not they are good candidates for permanent cosmetics due to their individual ethnic skin characteristics. For best results, it is important that you choose a technician who has had specialized training in the requirements and care of ethnic skin, and how this skin responds to the color application process. RichEyes.NYC has over 15 years of experience dealing with the specific cosmetic needs of people of color. We are specialists in the application of Permanent Cosmetic colors and camouflage for all skin types and ethnic backgrounds. We work closely with specialized estheticians to ensure that we address the special needs of ethnic skin as required. Depending on their ethnicity, some clients may have a propensity to hyper- pigment (get darker) or hypo-pigment (become lighter) as a result of a cosmetic procedure. As a precautionary measure, depending on the color and condition of your skin, we may recommend that our clients use Hydroquinone, Kojic Acid (licorice product), Vitamin C or lactic acid to bleach the skin for at least 2-4 weeks prior to any initial lip, scar camouflage or scar therapy procedure; or as a follow-up for 2-4 weeks after an initial color application. (Not all people of color will require skin bleaching prior to their initial procedure). If you already have hyper-pigmentation in the areas you are considering for permanent cosmetic color, you will need to lighten these areas in advance of your procedure for best results. Our technicians will be happy to make recommendations for you during your consultation. Choosing the right colors for ethnic skin can sometimes be challenging. After completing over 6,000 procedures, we have developed color formulations for the eyes, lips and brows that always look beautiful and age very well in the skin regardless of undertones. Scalp hair simulation – cosmetic camouflage for thinning hair in the scalp & hair line. Who is not a Candidate for Micro-Pigmentation? “lipstick inspired” colors into dark skin and achieve a satisfactory result. procedure. There is no known contraindications for women who are breast feeding. If you have an “active” auto-immune disorder, you must wait until you are in remission. You will need to wait 48 hrs before or after BOTOX around the mouth. You will need to wait 1 week after fillers in the lips. hold well in these areas for any length of time. Permanent lip color will last approximately 18 months to 3 years before fading. Have you ever had cold sores or fever blisters in your lifetime? need or want a touch-up. procedure and continue until the medication is gone. What Not To Do Before Your Procedure! Do not exercise the day of the procedure or following your procedure for 48 hours. Do not take Aspirin, Niacin, Vitamin E, Fish Oil or IBUprofen 24 hours before procedure. No alcohol or caffeine 2 days before the procedure. No waxing, tweezing, or tinting 2 days before the procedure. No Eyelash tinting or curling 48 hours before, or two weeks after the procedure. Do not wear eyelash extensions, or eyelash strips for 1 week prior or during the day of eyeliner procedure. If you use Latisse, stop using Latisse 2 weeks before your procedure. Do not wear contact lenses during or immediately following your eyeliner procedure. Remember to bring your glasses. You may resume wearing your contact lenses as soon as your eyes return to their pre-tattooed condition. Generally after 24 hours if you follow aftercare properly. Immediately following your procedure there is a crucial 10 DAY INK SETTLING PERIOD: This means NO HEAVY SWEATING, no water, cleansers, creams, makeup or any other products on treated area for 10 days. Avoid sleeping on your face for the first 10 days. 3-4 hours after your procedure, clean the treated area with the sterile water vial and cotton gauze that we provide you. Squeeze out the excess water from cotton ball, pad or gauze so that they are not saturated before wiping off any ointment or lymph fluids. DO NOT rub, pick or scratch the treated area. Let any scabbing or dry skin exfoliate naturally. Picking can cause scarring. NO facials, botox, chemical treatments and microdermabrasion for 4 weeks. On or close to the treated area. Use a good sunscreen, sun exposure will fade your permanent cosmetics. If you are planning a chemical peel, laser procedure or an MRI scan, please inform the technician of your permanent cosmetics. The use of Retin­A/Tretinoin or any other rapid skin exfoliation products used regularly on the forehead area will cause the permanent makeup to the eyebrow area to fade prematurely. The use of chemical peels and acid peels regularly on the forehead region can also cause eyebrow tattoos to fade prematurely. Am I a Candidate for Permanent Cosmetics? WHAT KIND OF PIGMENTS ARE USED? Can Permanent Cosmetics be Removed or Altered? Can I still have an MRI after I have Permanent Cosmetic Enhancement? RichEye.NYC began 2005 and is one of the first in the industry to pioneer semi-permanent cosmetics using a needle blade technique. Called the PIBrow Technique, the program is taught to technicians from all around the world. 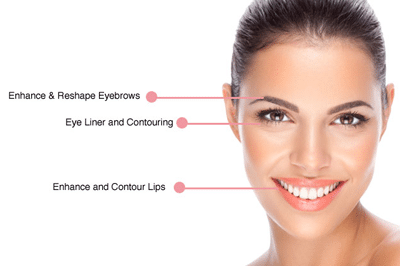 Our PIBrow technicians are Master Educators or Ambassador Members of PiBrows Permanent Cosmetic Enhancement which involve over 8 different permanent make-up disciplines. Making the PIBrow© Technique one of the most natural and effective PM procedures known in the industry. Permanent makeup is the name given to the “cosmetic” tattoo process. The application of permanent cosmetics will last most individuals up to 18 months or longer before requiring a touch-up or color booster. Unlike traditional tattoos, permanent cosmetic colors are more delicate, have larger molecules and are designed to mimic, hair, skin and makeup tones. These colors are less intense than traditional tattoo pigments, and therefore will fade sooner. Additionally, cosmetic tattoos are applied just under the surface of the skin in the top layer of the dermis. They are shallow tattoos and are therefore more susceptible to fading and UV damage. Every person is different with how well pigment holds in their skin. You can lengthen the life of your permanent cosmetics by protecting your skin from the sun and improving overall skin maintenance. Most people will choose to have their permanent makeup color touched up (boosted) within one to three years of the original procedure. If you have questions or concerns about conditions not listed here, please contact our main office for a confidential assessment. MEDICATIONS: Please note that certain medications can affect how a tattoo holds or processes in the skin. Some medications can cause a spike in the PH of the skin and cause a premature fading or a graying of the color. Additional touch up sessions or early booster sessions may be required to adjust color or artistry if this happens. We cannot predict which medications will affect tattoos as most individuals take one or more prescriptions medications. All medications affect the skin. All of our Cosmetic Tattoo Artists and technicians complete annual OSHA Certified blood borne pathogen certification, Red Cross CPR and Basic First Aid certification courses approved by the all states. We only perform consumer based Permanent Cosmetic Enhancement Procedures in Health Board Certified Establishments in accordance with the respective laws of a particular local. Healing time is approximately 10 – 14 days depending on how well your skin heals, but that time period is only for the top layer of skin. Microblading takes 30 days to heal fully. After the procedure area has healed, a touch up appointment will be needed. The process is not considered complete without it! Your touch-up appointment will be booked 4 – 6 weeks after your initial appointment. At the touch up, your Brow Specialist will be able to determine how your skin has healed, and if they will need to make any adjustments to the colour, needle size, or depth at which the needle is inserted into the skin. The Brow Specialist will be able to solidify the strokes done at the first appointment, as well as fill in any sparse areas, and place strokes between the already healed strokes. During healing, it’s normal to experience moderate pigment loss (40% – 60% on average). This is why the touch up appointment is so critical. The process of Microblading is only considered to be complete once your brows have healed following the touch up appointment. We use only inorganic mineral and synthetic pigments. There are organic pigments on the market, but there is a significantly higher chance of infection and unwanted bacterial growth with these kinds of pigments. RichEyes.NYC use a wide range of pigments for providing you with the best possible results. Your brow specialist will custom mix your pigment shade to match personal preference, hair color, skin tone, etc. Please let us know of any allergies or sensitivities prior to your appointment. You can always request a patch test on your arm during the consultation if your concerned. We are often asked if Permanent Cosmetics or Medical Tattoos will interfere with future MRI scans if needed. Our industry works very closely with surgeons in the Medical Field and MRI manufacturers. There is no concern about permanent cosmetics interfering or causing burns with today’s advanced MRI technology; however, you will need to disclose that you have a cosmetic or medical tattoo, just for the record. Scar camouflage used to correct a dog bite. HOW IS SCAR CAMOUFLAGE APPLIED? The RichEyes.NYC technician evaluates the scar at the beginning of each session and chooses a color or custom blends colors to best match the natural skin tone. A minimum of four sessions are needed on each scar to achieve the final results. Each session is scheduled three weeks apart. WHAT CAN I EXPECT AFTER EACH SESSION? There will be some temporary swelling and redness right after your treatment. This may take several days to disappear depending on which area of the body, and how much pigment is applied and the general health of the skin. Right after your procedure, the color will appear stronger compared with how it will ultimately look. Within a few days, the skin will start to slightly exfoliate and the color will become lighter to become the intended shade. No makeup should be worn on the pigmented skin for seven days after each session. Multiple sessions are needed in order to match the color. During each session, pigment is blended into the skin in layers. 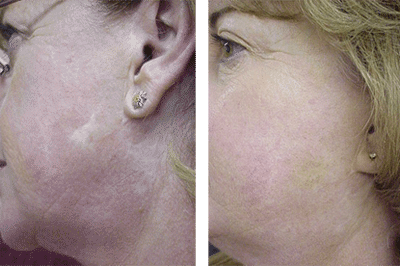 Because some of the pigment exfoliates after each session, a series of sessions are necessary to build the color into and around the scar to match the natural skin color. To become a new client for Scar Camouflage, we require photos. With photos, we evaluate your unique needs based on the size and location of your scar, and your skin color to be matched. After receiving your photos, we will contact you within two business days with your personalized treatment plan including estimated cost, number of sessions and schedule of treatments. RichEyes.NYC conceals and corrects permanent makeup by using colors that are carefully blended to conceal old permanent makeup inks. About half of our work is correcting permanent makeup and its side effects. RichEyes.NYC can greatly improve and correct permanent makeup anywhere on the face or body. Once of the most common, lasting damage from Permanent Makeup is from its colors changing into green, blue, orange. We can camouflage this with custom blended flesh colors if it’s in the wrong place or correct the color by applying a natural color over the permanent makeup. Another common problem that we see a lot with permanent makeup is the design is wrong. This happens due to poor training of permanent makeup artist due to their training only being a few days as well as lack of experience. It’s common for eyebrows to be too thick, too high, too long or just uneven. Eyeliner tends to be way too thick and/or uneven. Another reason for the design being wrong is that over the years the skin stretches or contracts as people age, gain or lose weight. So both the shape can be redesigned, and the color changed, for all forms of Permanent Makeup, Cosmetic Tattooing and Micro Blading. We are sincerely delighted to do this work, as the psychological and emotional benefits of correcting and concealing embarrassing Permanent Makeup will positively transform your confidence and outlook on life. The RichEyes.NYC application takes only an HOUR per appointment, with no down time. RichEyes.NYC clients participate fully in choosing their desired look, shape, and colors. Colors are customized individually for each client, so every RichEyes.NYC application is unique to the client’s desires and natural skin tone. An alternative to laser tattooing, a RichEyes.NYC technician first evaluates your current tattoo and your desires. You can choose to erase (blend-out) your current tattoo using custom skin color toned pigments. Using skin toned custom mixed pigments your technician works to precisely match your surrounding skin colors and tones. Our Natural-On mineral based pigment is deposited just above the original pigment at multiple depths using PIBROWS proprietary pigment placement needles that gently “pulse” new ink at the correct skin depth. 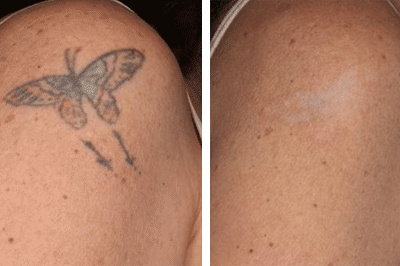 With the pigment deposited above the old pigment or on top of the old tattoo blending the old into your new desired look resulting in a new tattoo or neutral skin appearance. A minimum of 4 sessions are usually required on average to achieve desired results. Each session is scheduled 4-5 weeks apart. For coverup work sessions vary from 1 to 4 based upon the choice of the coverup tattoo design blending into the original design. Feel great – Camouflaging your embarrassing tattoo is an alternative to simply disguising it with makeup. Oftentimes clients chose a new tattoo modification. No painful laser surgery – Lasers take many more treatments to work and you won’t have to endure the time, expense, and pain laser surgery involves. Multiple sessions are needed in order to match the color. During each session, pigment is blended into the skin in layers. Because some of the pigment exfoliates after each session, a series of sessions are necessary to build the color into and around the target area to match the natural skin color. To become a new Tattoo Camouflage client, we require photos. With photos, we evaluate your unique needs based on the size and location of your tattoo, and your skin color to be matched. After receiving your photos, we will contact you within two business days with your personalized treatment plan including estimated cost, number of sessions and schedule of treatments. 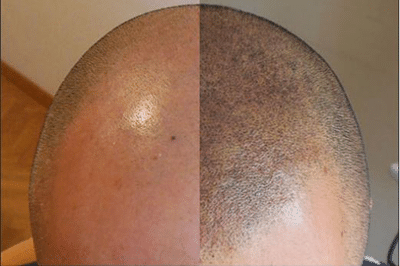 MICRO-SCALP SHADING RichEyes.NYC technicians use 3D shading and multiple layer pigment implantation simulating hair growth on bald spots, thinning hair lines, or for covering unsightly scars from donor or hair plug implants. Immediate long lasting results on any area of the scalp. Hair loss can be shaded, from the “dome” to the hairline. An ideal option for both men and women. Many styles and hair types are available. Colors are customized to camouflage, so it virtually blends with the existing hair to create a full, natural look complimenting both your features and your lifestyle. 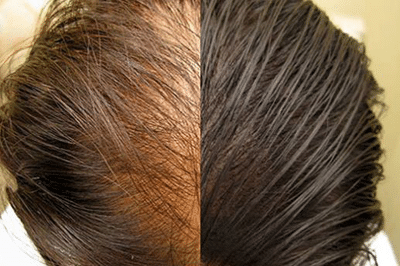 Hide unsightly bald spots and thinning hair lines. Affordable way to camouflage spot or full hair loss? Cover unsightly donor scars from strip hair transplant donor sights. Initially 4 sessions 2 weeks apart are needed for each area of the scalp. During each session more pigment is added into the scalp in thin layers gradually changing the color of the skin and hair density. Matching it to your natural hair texture and color. You see results after each session. Micro-pigmentation hair loss application averages about an hour per session, and there is no down-time. Clients fully participate in choosing their desired look, shape, and colors. Colors are customized specifically for each client. Each application processes is unique to the client’s needs. The treatment involves the gentle placement of mineral based pigments onto the outer dermal layer of the scalp. Before each session be sure sure to arrive with no products or topical treatments in your hair. After each session you will have to go home and wash your hair, as it will be messy from the procedure. You will see the results right away as the pigment settles into the skin. After each session the pigment will appear darker then over the next 2 weeks it lightens up in time for your next session where we add more pigment. After each session the color fades less. We will give you an after care kit that should be used 2 times per day for 5 days after each session. This will keep the scalp sanitized and moisturized. Each Scalp Shading client is unique, so the number of sessions needed to obtain the desired results will vary based on each clients individual situation. For a fast and easy alternative to an in person consultation, receive a free quote by simply emailing us your photos. With your photos, we will evaluate your unique needs and contact you within two business days with your personalized treatment plan including estimated cost, number of sessions and schedule of treatments. Simply take a picture of the area(s) that you want to treat and email it to us. All photos are kept confidential and are destroyed if you do not proceed with services. 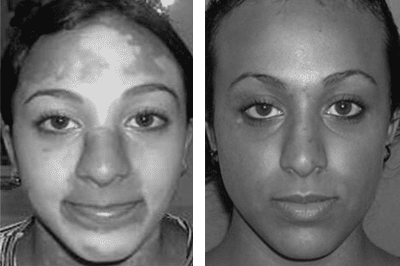 HOW EFFECTIVE IS VITILIGO CAMOUFLAGE PIGMENT IMPLANTATION? RichEyes.NYC Permanent Makeup is extremely effective in camouflaging vitiligo. Results are instantaneous and last up to 3 years with only minor fading. We implant pigment directly into the lighter patches of skin so they blend right in with your regular skin tone. It can be applied to the face, hands or elsewhere on the body. Upon very close observation it looks as though professionally applied make-up and concealer was applied although it does not wash off. With RichEyes.NYC and NATURAL-ON micro pigment a person with Vitiligo no longer has to worry about topical makeup, smudges or having to avoid messy clothing. Developed so that no one can tell you are wearing makeup. Looks more natural than makeup and eliminates all of the unpleasant side effects of so-called permanent cosmetics. Camouflaging Vitiligo requires multiple sessions depending upon the size of the area to be treated. There will be some temporary swelling and redness right after your treatment. This may take several days to disappear depending on which area of the body, and how much pigment is applied and the general health of the skin. It takes around 4 weeks for the pigment to settle into the skin with each session being scheduled within that same time interval. Averaging 4 sessions per treatment area. Multiple sessions are needed in order to blend the color precisely. During each session, pigment is blended into the skin in layers. Because some of the pigment exfoliates after each session, a series of sessions are necessary to build the color to match the natural skin color. Treatment area size also determines the amount of time required to implant pigment. Larger areas require multiple sessions simply due to their size. To become a new client for Vitiligo Camouflage, we require photos. With photos, we evaluate your unique needs based on the size and location of your scar, and your skin color to be matched. After receiving your photos, we will contact you within two business days with your personalized treatment plan including estimated cost, number of sessions and schedule of treatments. 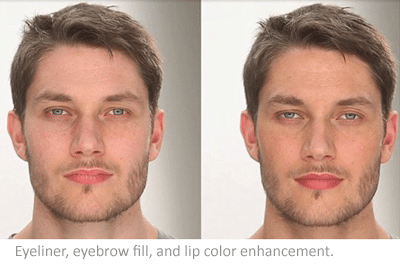 PIBROWS Micro-implantation pigment colors and technique is a game changer for men. Now natural looking long lasting semi-permanent makeup is possible. Popular areas of treatment are eyebrows, eye lines, scars, scalp and men with vitiligo. With 75% of our procedures being eyebrows, we have come to know the latest and most desired eyebrows today. For our men clients we have amassed a lot research. Therefore we are highly skilled in designing the correct style, shape, and brow contour, complimenting a mans features. The eyebrows we provide are the most natural looking possible. People would not know you had done anything unless shown under a magnifier glass to reveal your secret. HOW WE ACHIEVE NATURAL RESULTS Men’s micro-implanted makeup is semi-permanent except when implanted into the scalp. Due to the subtle differences in color and the semi-permanent nature of the pigment implantation, most micro-implant services require multiple sessions (2-4). Procedures are considered not fully complete until all sessions are performed. Scalp implantation lasts longer than facial or body pigment implantation. All procedures require infrequent refresh treatments averaging once or twice every couple years. Of course costing much less. Right after your procedure, the color will appear stronger compared with how it will ultimately look. Within a few days, the skin will start to slightly exfoliate and the color will become lighter to become the intended shade. Special topical creams are worn on the pigmented skin for seven days after each session. Multiple sessions are needed in order to shade in the color. During each session, pigment is blended into the skin in layers. Because some of the pigment exfoliates after each session, a series of sessions are necessary to build the color into and around the treatment area to achieve a very natural result. To become a new male client, we require photos. With photos, we evaluate your unique needs based on your objectives and skin color to be matched. After receiving your photos, we will contact you within two business days with your personalized treatment plan including estimated cost, number of sessions and schedule of treatments. PIBROWS© by RichEyes.NYC, All Rights Reserved.